COMEFRI high performance centrifugal impellers NPL and NPL ALU have been designed for clean or slightly dusty air, to achieve the best possible aerodynamic performance when not fitted within a conventional fan housing. The NPL impeller is manufactured in steel, with backward curved blades and painted finish. The NPL ALU impeller is manufactured in aluminium. The low total weight given by the aluminum alloy allows less load on the bearings (longer bearing- life), lower extra-load added on the structures concerned by installation, also contributing to a reduction on self-induced vibrations. CO.ME.FRI. S.p.A. certifies that the high efficiency free wheels backward curved NPL and NPL ALU for plenum fan are licensed to bear the AMCA Seal. 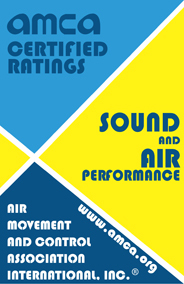 The ratings shown are based on tests and procedures performed in accordance with AMCA Publication 211 and AMCA 311 Publication and comply with the requirements of the AMCA Certified Ratings Program.